Drawing upon STEMgis, ShellGIS processes data 4-dimensionally over space and time, not only presenting outputs in traditional static layers, but also as graphs, within 3D viewers and as video animation. 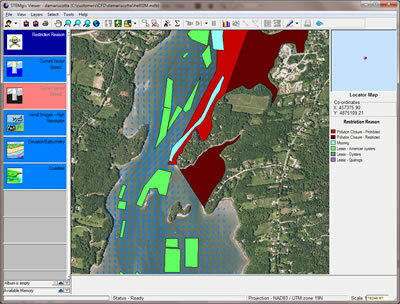 An example of static output is shown on the right, where STEMgis layers include existing lease sites (green), mooring sites (light blue), pollution closures (red) and current flow over the remaining available area. Hydrodynamics (i.e. velocity, direction, volume of seawater flow) can be visualized dynamically throughout a full tidal cycle with the STEMgis 3D Viewer. Alternatively, any point, area or transect in the system can be queried for environmental data, including growth and environmental effects of individual shellfish, not accounting for any interactive effects between shellfish density and hydrodynamics. Environmental effects are quantified as particle clearance rate, ammonium excretion, oxygen consumption and faecal production. These outputs may be useful when assessing consequences such as of integrated multi-trophic aquaculture (IMTA), shellfish restoration projects or carbon trading. In addition, growth and environmental effects can be compared for individual shellfish through the domain, not accounting for any interactive effects between shellfish density and hydrodynamics. 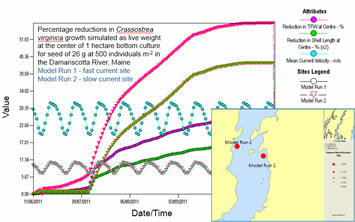 The animation to the left shows Crassostrea virginica growth simulated as total fresh weight in the Damariscotta River, Maine following culture from June to October (seed size was 26g). Interactive effects of seeding density and hydrodynamics on growth and environmental effects can be assessed at chosen sites during bottom culture. Alternatively, shellfish growth and environmental effects can be assessed according to seeding density through the domain, illustrating both where and when affected by current flow. 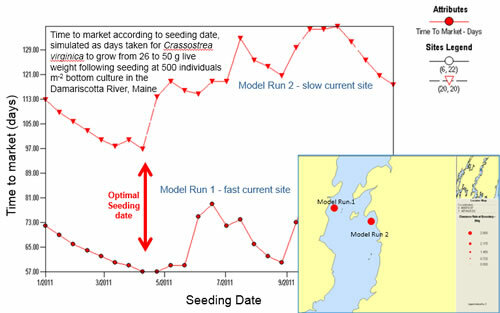 The animation to the above right shows that oysters planted at 100/m2 grow uniformly throughout the upper Damariscotta River. At 500/m2, growth is reduced in the middle of 1 hectare farms, especially in low-current areas (red and light blue) and less so in the channel (darker blue). At very high densities (1000/m2), much reduced growth is predicted throughout the system, albeit less in areas with the greatest current. 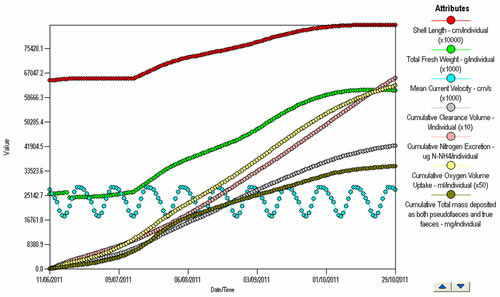 Effects of seeding date on time to market has been assessed according to seeding density at chosen sites during bottom culture. Alternatively, effects of seeding date on time to market can be optimized upon comparison through the domain.